The Hyperbaric Medicine Program at Montefiore, which emphasizes a focus on wound care, is a leading referral resource for hyperbaric medicine in New York. We heal chronic wounds and can often salvage limbs from risk of amputation, especially for patients who have compromised immune systems or diabetic foot ulcers. 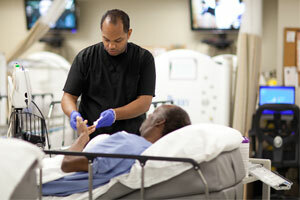 Hyperbaric Oxygen Therapy (HBOT) is a complementary treatment to overall wound therapy. During HBOT, a patient lies comfortably in an acrylic oxygen chamber and breathes 100 percent pure oxygen. This process helps fight infections, eliminates harmful toxins and promotes the growth of new blood vessels. Each patient at the Hyperbaric Medicine Program has a customized care plan developed by a multidisciplinary team of physicians, including: vascular surgeons, plastic surgeons, podiatrists, orthopedic surgeons, rehabilitative medicine experts, infectious disease specialists, nurses and technicians. We respond to the needs of the individual's wound before, during and after treatment. Each patient care plan includes a comprehensive approach to therapy and overall wound care as well as patient education. We assess the patient's baseline condition and determine if oxygen is critical to the healing of each wound. Our physicians also determine if the medical team can deliver enough oxygen to saturate the wound. Wound saturation allows for healing to continue for up to four hours after therapy. We have five Perry Baromedical Sigma Chambers, which are operated by certified hyperbaric technologists. Our cylindrical chambers, wider than equipment found at other hospitals' facilities, accommodate patients with confinement anxiety so that they will feel more at ease. All oxygen therapy treatment takes approximately 90 minutes each. Our chambers are equipped with flat panel televisions, blu-ray DVD players to make the patient experience more enjoyable.